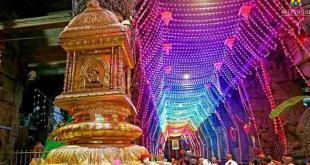 Srikalahasti Temple Pooja Online Booking is not available at this moments, devotees who are planning to perform Pooja, Abhishekam and other Sevas should visit in Temple in person. SriKalahasthi Temple is not having official website as such, there are website who will misguide pilgrims naming as Official website. It is always advisable to plan their visit person. 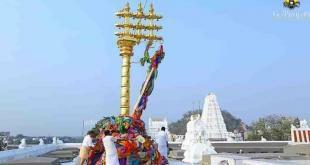 How to reach SriKalahasthi Temple by Bus from Tirupati Central Bus Station? 1) Direct buses to SriKalahasthi are available from Tirupati Central Bus Station. 2) A.P.S.R.T.C Buses which goes to Gudur, Sulurpet, Naidupeta goes via SriKalahasthi. 3) SriKalahsthi is 38 Km from Tirupati and Journey will take 1 hour max. 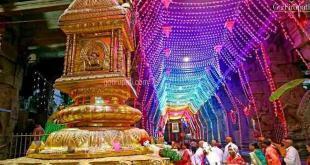 How to reach SriKalahasthi by Train from Tirupati Railway Station? 1) As SriKalahasthi is at shorter distance from Tirupati, there is no point-point services as such, but there are many trains which goes via SriKalahasthi , Journey will be 35 mins- 42 mins maximum. If you have any queries, comments or suggestions on Srikalahasti Temple Pooja Online Booking, please leave your comment below, we will get back to your queries at the earliest. I would like to perform Rahu Ketu Asheervada Puja & Rudrabhishekam on 16.12.18 and 17.12.18 respectively. I understand that Rah Ketu Puja can be done between 4.30 and 6PM which is Rahukalam and best time for this Puja. Am I correct? Can you please advise me on the timing of Rudrabhishekam on 17.12.18. and the duration of the abhishekam? I understand that the timing will be different during the month of Dhanu. You can perform pooja from 6 am to 6 pm, and rudrabhishekam will be performed 4 times a day and for more details contact 9393939150 . You can perform from 6 am to 6 pm and for more details please contact 9393939150.